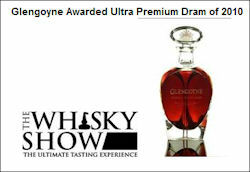 31.01.11, Edinburgh: Connoisseurs from one of the UK’s largest and most prestigious whisky events, The Whisky Show, have named Glengoyne 40 Years Old Highland Single Malt Scotch Whisky as the Ultra Premium Dram of 2010. Competing against over 20 luxury whiskies currently available in the global marketplace retailing from a minimum of £300, Glengoyne 40 Years Old was selected as the pinnacle dram that best captured the distiller’s art. A combined vote from visitor sampling and nomination for their preferred Ultra Premium whisky and a final tasting by Event Director Graeme Wallace and The Whisky Exchange proprietor Sukhinder Singh, Glengoyne was declared the ultimate winner of the ultimate whisky award. Praised for its “sweet, complex” and “oily texture”, it was noted that this Single Malt had remained “superbly balanced” and velvety smooth, without being overpowered by its 40 years of contact with the cask. Iain Weir, Marketing Director for Ian Macleod Distillers commented: “We are thrilled with this result. It is testament to the Glengoyne team’s craftsmanship and skill that the 40 Years Old has succeeded in winning this very prestigious title against such a high calibre of entrants. Owned by the Scottish, independent, family owned company Ian Macleod Distillers Ltd, Glengoyne distillery has been producing whisky from the heart of the Trossachs for over 175 years. With a highly selective cask policy, Glengoyne is also distilled slower than any other single malt Scotch whisky. Using air-dried malted barley, rather than pungent peat smoke, the distillery nurses the spirit through its stills at around one-third of the normal rate. This creates a more subtle, complex whisky in which all of the delicate flavours are freely allowed to express themselves. Only 250 bottles of the limited edition Glengoyne 40 Years Old have been produced, retailing domestically for £3,750, this luxury whisky is presented in a hand-blown bespoke crystal decanter and stitched leather and solid oak presentation box of the highest quality. For further details on stockists and distribution details for Glengoyne, contact Alan Wardrop, UK Sales Manager, Ian Macleod Distillers, 01506 852205.